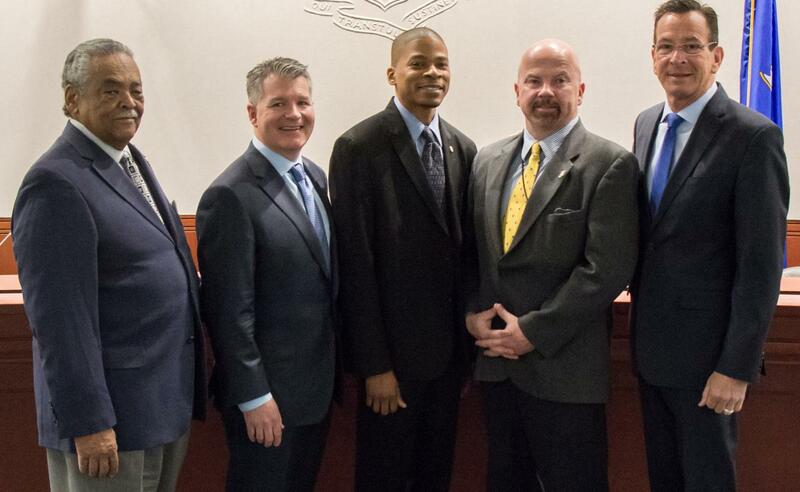 Sen. Ed Gomes, CEO William Newbauer III, Councilman David Hardin, Rep. Joe Gresko and Gov. Dannel Malloy shown after approval of funding. Rep. Joe Gresko announced today the State Bond Commission’s approval of a $2 million financial assistance package for Stratford’s Hubbell Electric Heater’s proposed expansion and job creation project. The company is a manufacturer of water heaters and water heating systems for the commercial, industrial, marine/naval and foodservice markets. “It is comforting to know that the state does in fact understand the value of business and is showing the foresight to invest in the manufacturing sector and foster growth opportunities,” said William Newbauer III, chief executive officer of Hubbell. “There is no doubt that by having access to this state offered financing package, that we will be able to accelerate our growth beyond what we otherwise would have the means for, and thus return to the community even greater opportunities for meaningful jobs and careers in manufacturing,” Newbauer said. Senators Edwin A. Gomes and Kevin C. Kelly joined with Gresko in praising the financing for Hubbell. The financial package will assist Hubbell in several aspects of the company’s growth strategy plan. Part of the company’s three-year growth plan includes investing in employees, plant expansion and acquiring additional machinery and equipment to improve efficiency and allow the company to expand its product offering. Hubbell has pledged to add a minimum of 35 new employees in several positions, including engineering, production, marketing, manufacturing, quality control, and administrative staff. The terms of the assistance call for the company to retain 61 jobs along with creating the 35 new positions within four years. The loan will be provided at an interest rate of 2 percent for 10 years with the principal deferred for one year. The company will be eligible for loan forgiveness of $750,000 if it retains and creates the jobs within four years.